Concertainer Gabions are a revolutionary design of wire mesh baskets formed by connecting individual panels of mesh with helical spirals on the vertical edge wires creating an open series of box compartments, that fold in a concertina fashion to be flat packed. Lids and bases are sometimes supplied loose with helical spiral binders to connect the top and bottom of the open cells along one edge. Alternatively they may be factory fitted where practical for transportation purposes. Please feel free to contact a member of our sales team on +44 (0)2890 454599, or click the button below to send your enquiry via email. Click on a thumbnail to enlarge the photo and see a caption. 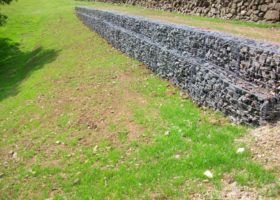 Gabions are engineered retaining structures designed as mass gravity walls to hold back earth or other solid materials with out overturning, sliding or foundation failure. All designed gabion walls should be checked by a suitably qualified structural engineer on site prior to construction. Weldmesh Mattresses are prefabricated from welded steel wire mesh. They are pre-clipped in a penfold fashion, with stainless steel clips every third mesh space in the factory, with the lids left loose for transportation purposes. The units flat pack down for storage and ease of handling. See also Ridgeway Renewables and Kyowa Filter Units. Such structures are normally built at an inclination of 6 degrees and with a stepped front face depending upon individual requirements. To facilitate the ease of filling and aesthetic appearance to the structure, the mesh fabric is available in a range of wire diameters to suit the given application. It is common practice to vegetate gabion walls after construction with trailing plants placed at the toe, rear or on the steps of the wall. Click on the links below to download the file.